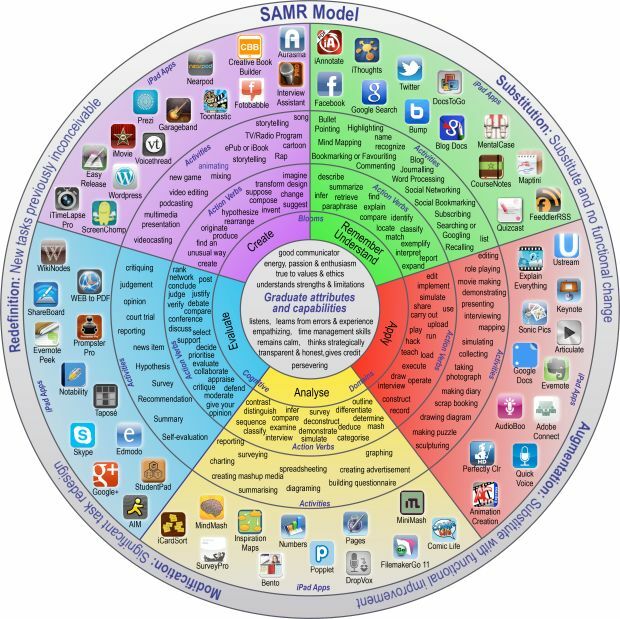 The SAMR Model (Substitution, Augmentation, Modification, Redesign) offers some insight into different ways that technology can support the engagement of learners, as well as a description of the process through which educators (who are generally digital immigrants versus the digital natives they teach) grow as they broaden and deepen their facility and comfort with new tools. The picture above uses common programs and apps to illustrate how these different descriptors of technology use play out in the classroom. This entry was posted in 21st Century Skills, Education, Miscellaneous, Technology and tagged 21st century learning, creativity, digital immigrant, digital native, innovation, SAMR, technology by cmschilly. Bookmark the permalink.